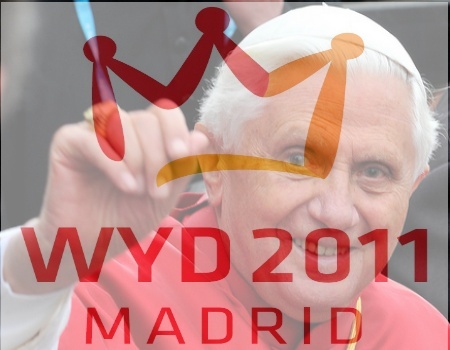 World Youth Day 2011 will be celebrated in Madrid from August 16th to 21st, 2011. What is World Youth Day? It is a great worldwide encounter with the Pope which is celebrated every three years in a different country. Why is it celebrated? To share with the whole world the hope of many young people who want to commit themselves to Christ and others. Is it just for Catholics? No, WYD is open to all young people who want to take part in a festive encounter with their contemporaries centered on Jesus Christ. What is it “to live a WYD”? It is a unique way to deepen your faith and grow closer to Christ, by means of prayer and the sacraments, together with thousands of other young people who share your interests and ambitions. This year’s image or icon for the event holds a treasure trove of information as to where the Holy Spirit is leading the Church and what may be to come. If I am right, then the next World Youth Day will be in the America’s. I think in Mexico City, near Our Lady of Guadalupe. We will see if I am right, but just in case I am, I wrote this August 7, 2011. Let’s look together at the icon for the Madrid World Youth Day. First of all, we clearly see that Jesus Christ is the source and summit, in the very cross on the crown. Who is the crown? The crown of creation is and are human beings. Male and Female He Created them. In fact, it was Dr. Alice Von Hildebrand that jokingly said it was “woman” that was the crown of creation as woman was made from the image and likeness of God whereas man was made from the dust of the earth. The “M” is for Mary and is fused with another M for Madrid. 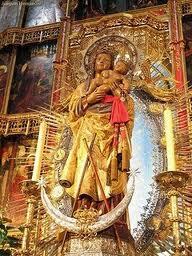 The crown also invokes our Queen, Mary, specifically “The Virgin of Almudena” — more on her below. We also recall that we are called to wear a crown of thorns, instead of an earthly one, joining our sufferings to those of Christ on the Cross. The colors of red, orange and yellow symbolize the warmth of God’s love for us. Red also is the color of martyrs reminding us that we are being called to die to self. The stylized figure facing right in the kneeling posture of prayer reminds us that it is right to give God thanks and praise. 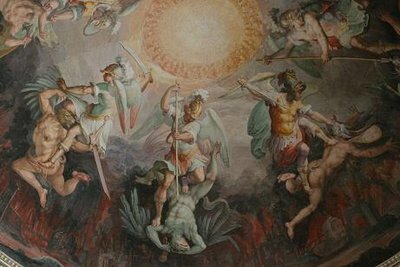 The words inscribed are the names of Jesus and Mary, our New Adam and Our New Eve which have, through their very gift of self, opened the gates of heaven and overcome hell itself. We are called to be redeemed by Jesus by way of Mary. Most of us who hear of “Our Lady of Guadalupe” immediately think of the Tilma image from Mexico, but remember that there is another Guadalupe image from Spain called Our Lady of Guadalupe, Extremadura. This is an icon given by Pope Gregory the Great to the Archbishop of Seville, and is a statue icon created by St. Luke, protector of the faithful in Spain during the Muslim/Islamic uprising. Later, Queen Elizabeth, Cortez, Bishop Zummaraga (the first Bishop of Mexico who was later presented with the Tilma and image of Our Lady of Guadalupe) and even Columbus all visited Our Lady of Guadalupe in Spain to consecrate and dedicate themselves and their lives work to her. 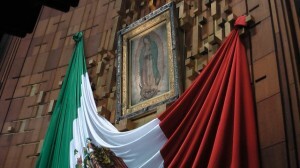 Although Our Lady of Guadalupe from Spain is not the same image as Our Lady Guadalupe from Mexico, it is obvious that Mary desired for the Catholic Faith and her particular intercession and grace to be the soil upon which future persons living in the Americas would be “rooted”. Notice how the image of the Patroness of Madrid “The Virgin of Almudena” looks very similar to Our Lady of Guadalupe from Mexico. There is also a Pilgrim Cross and Icon that have been traveling the globe since 2003. Let’s look at the Icon and it’s many meanings about the central role in salvation history that Mary has and is playing. I just want to re-iterate the importance that Icons are playing in the New Evangelization and I expect their role to become central and integral to this in the next few years. 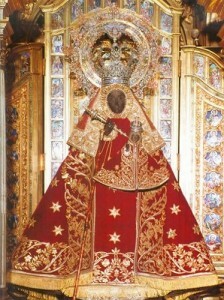 This type of Marian Icon is known as an ‘Hodegetria’ image, a word meaning, “Guide of the Way”. What is an Icon? An Icon is said to be “written” not painted because it is sacred art that has a purpose. It is a Catechism in color. Every line, every detail, means and teaches a theological truth about God and man’s relationship to Him. Icons are spiritual doorways because when we contemplate them, there is an internal movement towards God incarnate, and when we move toward God, He moves towards us. Icons are like God incarnate because they are the physical manifestation of theological truth. They make visible the invisible. It has been said that every man and woman are icons because we are made in the image and likeness of God, male and female, so that to see a “persons” is to see the likeness of God. Perhaps that is why we greet one another with a gesture of reverence. Some cultures shake hands and some bow in the presence of others. So now, in a world where the belief of the supernatural is almost lost, we are once again in need of a simple catechism. Like children, we need to be re-engaged through the beauty of pictures. “Beauty will save the world” and perhaps sacred art is the very beauty Dostoyevsky was speaking of. “The eyes are the window to the soul” is an expression we grew up hearing. In the case of an icon there is an invitation to our very person to enter into the mystery incarnate in the image. Icons are Theology of The Body in Color. Icons are about the incarnation and therefore the eyes, the nose, the mouth, the ears, in fact the body and the means by which we obtain information about our world around us, our senses, are revealed in icons as instruments of holiness. 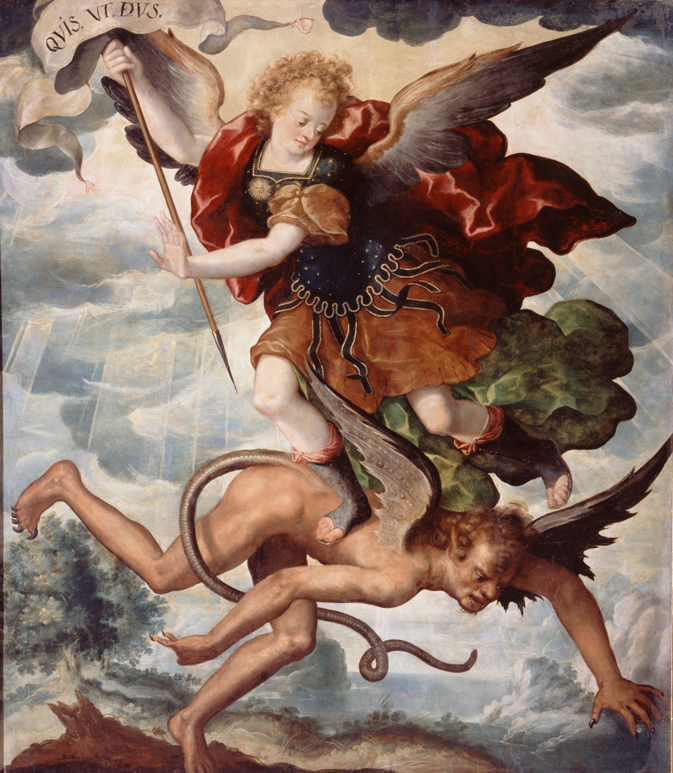 While concupiscence is the effects of original sin on the body, the body itself is NOT sinful and this distinction is being revealed through sacred art, Praised Be Jesus Christ! Mary’s large almond eyes reveal not only her holiness, but knowledge that is beyond ordinary sinful mortal persons. Gazing upon this icon we can be evangelized by beauty andby looking upon beauty so the call to grow in mature purity is being heralded. What good are eyes if we can not see past the exterior or those around us? We are called to “see” the very “person” of everyone we meet. In this image, Jesus gestures of blessing declares his own name as Christ and his two natures. The two fingers reveal He was both God and Man. The curvature of His fingers are the signs for the Greek letters which “write” the word Christ. 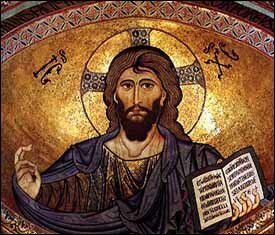 One finger up for the I, the next curved slightly for the C, the crossing of the ring finger for the X and the pinky slightly bent for another C. This is found also in the teaching Christ Icon “Christ Pantocrator”. The upward gaze of Jesus is an invitation to keep our own gaze on things that are heavenward and upon where he himself looked. Where does he look? He looks upon his mother. She will be our guide in this upcoming and turbulent time ahead in the Church. Not only is Mary our guide, but this particular painted Icon Salus Populi Romani ( Protectress of the Roman People), is attributed to Saint Luke. The legend says that Saint Luke painted the image on the top of the table of the Holy Family, crafted by Jesus. Saint Luke listened to Mary tell of the life of her son as he painted, later recording the details in his Gospel. So you see, once again we have another tie in to Our Lady of Guadalupe from Spain as that also was an Icon attributed to St. Luke. The unity of soul and body is so profound that one has to consider the soul to be the “form” of the body: i.e., it is because of its spiritual soul that the body made of matter becomes a living, human body; spirit and matter, in man, are not two natures united, but rather their union forms a single nature (365). In summary, it seems that Mary, through inspiration of the Holy Spirit is moving us in the direction of re-establishing the dignity of the human person through Iconography as well as an invitation to the mystical and spiritual revelation that Icons convey by means of images. We are also being invited to contemplate the relationship of Mary and Jesus for it is in this understanding that we will be more firmly “rooted” in our faith. For 26 years, World Youth Day has been an opportunity for the young adults to engage their lives, their persons and their gifts. Will you accept that invitation? Because when and if you do, you will be embracing your greatness and remember, one person can change the world and that one person is you! There is an App for phones to stay connected to the day to day news, photos and events at World Youth Day 2011 in Madrid through the iGPII application. All proceeds help to fund future World Youth Days. 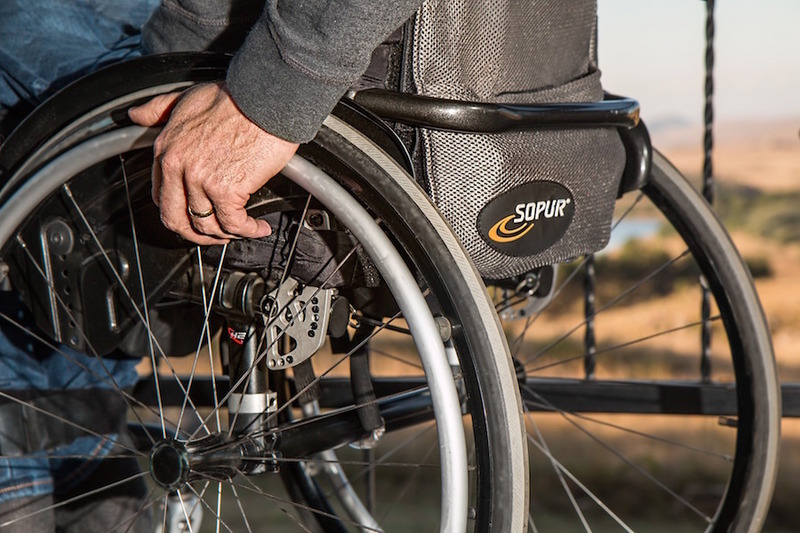 Also visit here for more ways to live World Youth Day. Speaker for Catholic Answers, CMG Booking, TMG, St. Joseph Communications and others. Freelance writer and mother of 8 children ages 2 to 21. Married to Shawn King for 17 years who is a convert from Jehovah's Witness.